Many a gardener has found growing cauliflower to be challenging and frustrating, but it isn’t hard once you know the secrets of what makes cauliflower happy. It is one of the most persnickety and temperamental of vegetables, but give it what it needs, and it will feed you well. Cauliflower needs very fertile soil, with plenty of nitrogen. You can do this by providing your cauliflower bed with lots of high-nitrogen compost (well-rotted and made with lots of coffee grounds or some manure) and giving it a higher-nitrogen organic fertilizer once or twice during its life. It likes a pH in the 6.5 to 6.8 range, but how many of us tweak our soil pH to please a single crop? 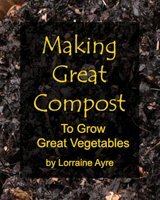 A ton of compost usually buffers things well enough to make most plants happy. Cauliflower seedlings are also sensitive to transplant shock, and appreciate a dilute dose of liquid fertilizer when transplanted. Compost tea, manure tea, or fish emulsion can all help. It’s best to start growing cauliflower indoors where it’s warmer, in seed flats under lights. I like to use trays of 4” square pots, which I get free from the nursery by asking nicely for their leftovers. Plan it so that your transplant-out date is 2 or 3 weeks before your average last frost. Since your cauliflower seedlings should be around 6 weeks old when you plant them out, that means to start them indoors about 8 or 9 weeks before your last frost. I start mine indoors, but plant them out when they’re only about 3 or 4 weeks old, because I put them under a temporary hoop tunnel which has warmed the soil and gives the seedlings some frost protection. Cauliflower likes consistent conditions. Like the 3 Bears, Baby Cauliflower likes it “not too hot and not too cold” as well as not too wet, not too dry, not too many bugs and not too cramped. The seedlings like consistent, middle-of-the-road conditions. Don’t let them dry out, get hot or cold, or grow spindly and root-bound in flats or 6 packs, or they’ll decide not to make proper heads. Cauliflower is susceptible to all the cabbage family bugaboos: cabbage loopers, cabbage root maggot, imported cabbage moth/worm, aphids, and flea beetles (when little). The absolute best way to protect them from any of these is mechanical, not chemical: grow them under floating row covers such as Reemay, which will prevent the bugs from getting to the plants. Other organic pest control measures work too, but an ounce of prevention is worth a pound of cure! 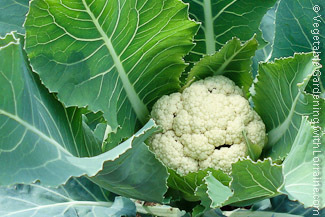 Cauliflower is also affected by some common plant diseases like clubroot and downy mildew. “Blanching” in this case does not mean dipping in boiling water prior to freezing. It refers to the common practice of tying a cauliflower’s leaves up over the developing head to keep the sun off it so that it stays white. I’m not sure this is a nutritional improvement (chlorophyll is good for us, after all), but it is traditional, and we do seem to expect cauliflower to be white. When the head starts to form and is about 2 or 3 inches across, tie the leaves up by loosely balling with cotton string. Leave plenty of room for the head to form, and make sure you check the plant frequently for the next several days. Most cauliflowers form a completely ripe head within about a week or ten days, and if you let it go too long it will start to get airy and spindly, and lose flavor. After you harvest the cauliflower, the plant is finished, so pull it up and put it in the compost, with thanks. I think one of the reasons I love growing cauliflower so much is precisely because it is so finicky to grow. When I finally get a lovely cauliflower head, I feel like a proud parent, and enjoy every bite! Blessings on your cauliflower crop, friends. Send me your success stories (or failure stories!) and photos, and I will post them here (on your very own page), where others can comment.